Replacement modem, tested used pull. This is the modem only and does not include the filter. For all Power Mac G5 June 2004 and Early 2005 (1.8/2.0/2.3/2.7 GHz) Also used in: iBook G4 (12-inch Late 2004), Power Mac G5 (June 2004), eMac (USB 2.0), iBook G4 (14-inch Late 2004), Mac mini, POWER Mac G5 (June 2004), PowerBook G4 (12-inch 1.5Ghz), PowerBook G4 (12-inch 1.33Ghz), Power Mac G5 (Late 2004), eMac (2005), eMac (USB 2.0), iBook G4 (12-inch Late 2004), iBook G4 (12-inch Mid 2005), iBook G4 (14-inch Early 2004), iBook G4 (14-inch Late 2004), iBook G4 (14-inch Mid 2005), iMac (17-inch), iMac (20-inch), iMac G5 (17-inch), iMac G5 (20-inch), iMac G5 ALS (17-inch), iMac G5 ALS (20-inch), Mac mini, Mac mini (Late 2005), Power Mac G5, Power Mac G5 (Early 2005), Power Mac G5 (June 2004), Power Mac G5 (Late 2004), PowerBook G4 (12-inch 1.33Ghz), PowerBook G4 (12-inch 1.5Ghz) Our $29.77 price includes domestic shipping. 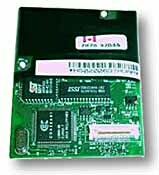 Zoom Modem/PC Card 56K - New! 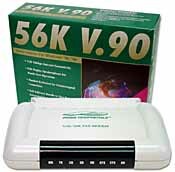 Brand New 56K PCMCIA FaxModem with 33.6 kbps Data and 14.4 Kpbs Fax capability. 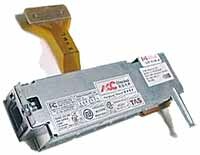 Fits any PowerBook with a PCMCIA Type II Card Slot. Uses Supra drivers or included Zoom CCL's. V.42bis and MNPS data compression. Standards Supported: K56flex, V.34, V.32bis, V.32, V.22bis, V.22 A/B, V.22, V.23, V.21, Bell 103/212A. New in box includes phone cord. $39.77 shipping included. 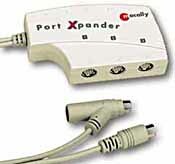 PortXpander - Multi serial port switch - Auto-Switching: With MacOS system 7.1 version or later and Apple communication Toolbox installed (Included in the MacOS system), users of Port Xpander can configure any CommunicationToolbox savvy applications or devices such as Claris Works, FreePPP, US Robotic's Pilot, and Visioneer's Paper port to recognize an virtual serial port and automatically switch to that port when the application or device driver is launched. 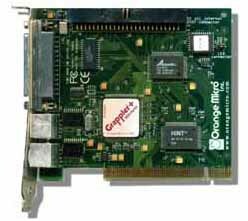 Prevent Damage: Port Xpander can reduce the hassle and potential damage caused by plugging and unplugging serial devices into your Macintosh while the system is on. Easy to Use: The Port Xpander is controlled by Control Panel and Port Xpander Menu or any applications that supports Apple communication Toolbox. RS-232, RS-422 and GeoPort Device Compatibles: The Port Xpander is compatible with most RS- 232 & RS-422 interfaced serial devices at any speed. Used, tested unit with manual. Suggested Retail $69.00 Our price includes shipping $39.77 Supply is limited order now! Beige G3 Apple Internal 56K V.90 Data/Fax SERIAL Modem SALE! SALE! LOWEST EVER PRICE! We found a small supply and are dropping our normal $79.77 price to $24.77! Add an Apple Internal Modem for your Beige G3! Fit into the personality card of either the Mini TOWER or DESKTOP models. These are used tested pulls and have been upgraded to the latest firmware. These are rare and we highly recommend you use a modem surge supressor. Uses the built in Apple software and takes the Apple/GV settings. Standards: V.34, V.90, K56Flex. Supports most all Fax software. Someone asked why these were expensive. They are rare and cost us much more these days. We spend about a 1/2 hour per modem installing, updating the firmware and otherwise testing each unit.We include our Kitchen Sink CD ($9.99 value) which includes Telecom, Internet and Fax Software. Was $79 Special $24.77 includes domestic shipping. Noisy lines got you down? ZBlocker-Z200SM from Excelsus Technologies is an in-line phone filter was originally designed for ADSL data modems but work great with any phoneline and modem. Prevents interference between the modem and telephone set and reduces the effect of POTS generated noise. Four conductor mod phone jacks on input and output. Short cord for wall connection. Item will vary from picture. UL,CSA listed. Complies with FCC part 68 regulations. Includes shipping. Line Privacy Protectors (pair) - New! Protects modem, fax and voice transmissions from interruption. Prevents your mom (wife, sister, brother, dad, or stupid roomate) from interuppting your downloads. The first device to answer or access a line secures the line. All of the others are denied access until the first device hangs-up. Easy to use. Installs in seconds between phone line and wall jack. Note: You need one unit for each instrument sharing a line. This is sold as a set of 2. Order additional if you have many extensions. Shipping included. Retractable Modem Phone Cable - New! This retractable modem phone cable will help eliminate cord clutter on your desk. Maximum length 10 foot. Also great to use with your laptop when traveling! Just $2.99 with any purchase. T-Adapter for Modular Jack - New! For connection of two phones or one phone and fax or modem etc. to one jack. Includes shipping. Modular Cord Coupler - New! Easily add another cord as an extension. Couples two items with modular plugs together. Includes shipping. 14 foot modular line cords for connecting modems, faxes, phones, phonenets, etc. Includes shipping. 56K V.90 External Serial Modem - USED! $29.77 shipped! Various name brand tested working used 56K modem, we include a Mac cable adapter and drivers on our Kitchen Sink CD. This one works through your Mac's modem port. (Item may vary from picture). Fax the world, or surf the net with this external data/fax modem! We include setup information for FreePPP, Modem Scripts for Apple Remote Access, Shareware Fax Program, Zterm Shareware Terminal software and TeleFinder Client. Includes Modem, Power Supply or Cord, Phone Cord, and Software/Drivers on our Kitchen Sink CD. Our price $29.77 includes shipping.